Came across this interesting blog recently. One of the reviews is for one of my favourite lunch spots in Civic, the City Labor Club. I think the price may have gone up slightly since this review was written a couple of years ago. That said, they’re still hard to beat for value and taste. This entry was posted in Current Top Ten - highly recommended, Recommended by others and tagged Canberra, CBR, club, labor, schnitzel. It would depend on how it’s done. A lot of places emphasise how big their schnitties are and it’s probably not something my two employers would condone as government health agencies concerned about healthful living. If it’s about quality of schnitties I reckon we could set a challenge for Canberra food bloggers. Perhaps over a fixed period of time (say three months) sample schnitties from around Canberra and rate them. 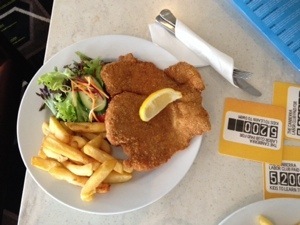 I’m yet to have a GREAT schnitty here, and the price of them?! My lord!